The Dordogne flows so peacefully by this idyllic spot, it’s hard to imagine why the local lords needed to build a fortress. In 1342, the Vicomte de Turenne gave his permission for a defensive keep at a place called La Treyne. After various owners, the de la Ramière family took over the property in 1553. During the Wars of Religion the castle was burned; it was rebuilt later during the reign of Louis XIII. In 1711 Marie de la Ramière married her cousin, Jean de Cardaillac-Vegennes, and the castle remained in the Cardaillac family until 1910. I love the way this fairytale castle perches above the river. On the outside terrace overlooking the river there is a tiny tower that used to hold a table just for two. The last I heard the table is no longer there, but check to see if it’s back. I hope so; it was one of the most romantic dining spots on the face of the earth. On the Uber Guides Top 10 Castle Hotels of Europe (I was a talking head), le Château de la Treyne was rated #1—well deserved! It is one of my favorite castle hotels. 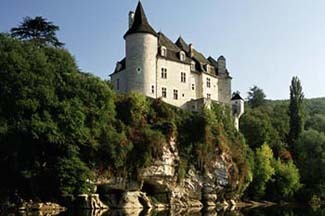 The château is situated along the Dordogne River off D-43, 10 km northwest of Rocamadour. The nearest rail station is in Souillac. The fun just begins when you drive through 300 acres of parkland and enter the formal French garden that borders the château. When the staff comes out to greet you, the welcome is so warm and genuine that you’ll feel like you were born here. Inside, white stone walls accentuate dark wood paneling, antiques, and lush tapestries. A stone staircase leads to the charming guest rooms, which bear individual names such as the Soleil Levant (in the castle’s former chapel) or Louis XIII. Nights are spent in a carved canopy bed; in the morning, just roll over to gaze at the gardens below. Or splurge on the Prison Doreé, an apartment secluded in the stone walls atop the castle tower. On chilly nights a blazing fire warms the Louis XIII dining room, with its rich, wood-coffered ceiling and fine artwork on the walls. China, crystal, and silver grace the tables. Summer nights are perfect for dining on the terrace.